VTA was notified today by the Federal Transit Administration (FTA) that a Record of Decision (ROD) has been issued for the next six miles of VTA’s BART Silicon Valley Extension into downtown San Jose and Santa Clara (Phase II). Receiving the ROD is a required next step for projects seeking federal funding, making this a critical milestone. It signifies that VTA satisfied the requirements of the National Environmental Policy Act (NEPA) for the $4.7 billion project. As the project sponsor, VTA is applying for $1.5 billion in FTA New Starts Program funding, completing the Phase II funding plan. VTA has already secured 70% of the funding through two local sales tax measures and a $750 million Senate Bill 1 state grant. The ROD is issued once extensive environmental analysis and public review is completed, which is documented in the Final Supplemental Environmental Impact Statement (FSEIS). The FSEIS assessed alternatives considered, public comments made during the draft environmental document phase and responses to those comments, and provides the basis for the decision and measures required to mitigate potentially adverse effects. Now that a ROD has been issued, VTA will begin the engineering phase of the project and apply for federal funding. 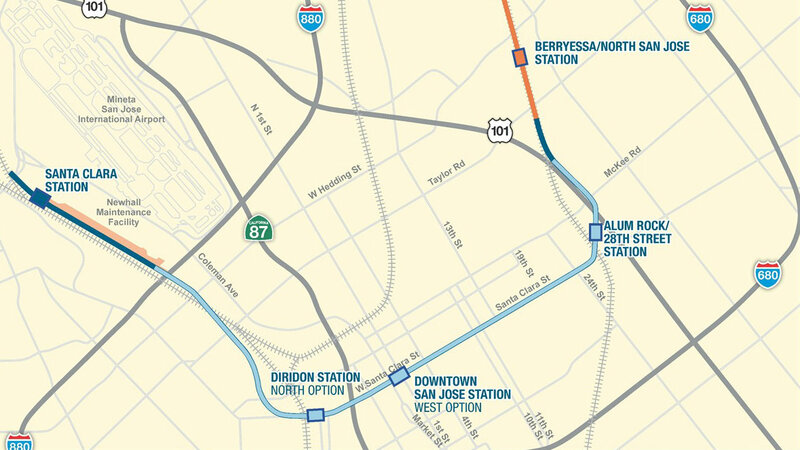 VTA’s BART Silicon Valley Phase II Project is a six-mile, four-station extension that will expand BART operations from Berryessa/North San José through downtown San Jose to the City of Santa Clara. The Phase II Project completes the full 16-mile extension from the Warm Springs/South Fremont Station into Santa Clara County, enhancing regional connectivity linking BART with VTA’s light rail and bus network, Amtrak, ACE, Caltrain and Capitol Corridor. It will help reduce regional traffic congestion and spur transit-oriented development around stations, providing increased access to jobs, housing, and education. Phase II includes an approximately five-mile subway tunnel, three underground stations (Alum Rock/28th Street, Downtown San Jose, Diridon), and one at-grade station (Santa Clara). Construction is planned to start by 2021 with passenger service by 2026, serving a projected 52,000 weekday riders by 2035. Once constructed, the extension will be operated by BART, as part of its regional rail system.